Hannah Mills says she and 470-class partner Saskia Clarke are in good shape for 2016 in spite of losing out in the Olympic Test event in Rio. The pair had to settle for second behind American duo Anne Haeger and Briana Provancha after being penalised. "It's been a challenging week," said the 27-year old from Dinas Powys. "We had to turn on and off in concentration... and I think we've proven we're really good at that and we can take that forward to next year." Mills and Clark's won silver at London 2012, and their performances have ensured Britain will have a boat in the 470 class at the Rio Olympics. In June, they won the 470-class at the World Cup regatta in Portland. However, the final crews will not be confirmed until next year. 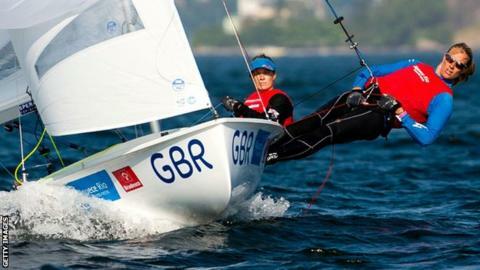 The British pair were leading going in to Sunday's race, but made a mistake at the start and impeded another boat. They then compounded the error when completing the wrong number of penalty turns and had to serve another penalty, something Mills admitted was "a mess". She added: "We made some massive errors off the start line, infringed somebody so had to do turns and then didn't do the right amount of turns so had to do another penalty. "We were so far behind at that point and a very strong left hand track it would seem that there was no way back into the race unfortunately. "We're just very disappointed with our execution and are very frustrated. "It's particularly disappointing as we had an otherwise really great week in Rio. "It's a really tricky place to sail and we dealt with it as best we could to be ahead going into the medal race. "We've said a lot that ultimately it is going to come down to the medal race next year so that's something we need to look at. "It's kind of like a 100m final - you can win the semis and it doesn't matter much if you don't perform in the final."